I had earlier heard about Pakistani drama and had seen one or two of their dramas. But not tried or heard about any movie from Pakistan. 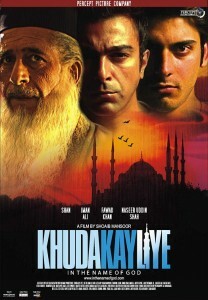 But the movie “Khuda Kay Liye” directed by Shoaib Mansoor sprung up as a surprise due to its rave reviews. Making movie on a controversial topic is really a bold move by Shoaib Mansoor. And my taste is for controversies. This is the first Pakistani film officially released in 2007 in India. So I “rented a DVD” and I came away truly amazed after watching this movie. It’s not only the most important film to come out of Pakistan for as long as one can remember, it is, more importantly the most relevant mainstream film on Islam that you’ve possibly seen. It addresses pertinent issues like Islamic fundamentalism, the status of women in contemporary Islam, erroneous interpretations of Islam, the consequential effects of 9/11 on Muslims in America, and the divide in Pakistani society between the liberals and the extremists. The film also features a few subtle digs at India like when the older brother meets a white student in Chicago, he says “We built the Taj Mahal! !”, what?! “We mean Muslims”, oh ok! So what about Indian Muslims? …….. It also shows what the Pakistanis think about Indians. The film follows two brothers who are musically inclined. The younger, Sarmad is brainwashed by a radical Muslim cleric into believing that music is against Islam. Distancing himself from his art, he abandons his family and joins a fundamentalist group in a village in the outskirts near Afghanistan. Misled into believing that he’d be upholding the honour of Islam by doing so, Sarmad agrees to be married to his London-bred cousin Mary against her wishes, and on the insistence of her hypocrite father who wants to end her relationship with an English boyfriend. On the other hand, Sarmad’s older brother Mansoor, a liberal, signs up for music school in Chicago where he finds his soul mate in an American girl. All’s going well for them until 9/11 happens and Mansoor is wrongly accused of having terrorist links only because he’s a Muslim. While the entire principal cast has put in a fabulous performance, its Naseeruddin Shah in his brief appearance in the climax as the long bearded progressive Islamic scholar with his dialogues (‘There is beard in religion, but no religion in beard’ and ‘Two men who did the greatest service to Islam in Pakistan, Mohammed Ali Jinnah and Allama Iqbal, did so without a beard and out of the so called Islamic dress code, in western dress.) who literally steals the thunder. It is learnt that, he had liked his part so much that he even did the role for free. The music of KKL struck the right note considering the theme of the movie. However, the movie did not do well in India, well, in my opinion, due to the fact that the issues in the movie are not pertinent in India. Our audience cannot identify with these issues. However, despite the above and the amateurish acting, the film will hook you till the very end. Way to go!! Previous postAre We Alone? Are UFOs real? Next postWere Hindu Gods none other than Ancient Aliens?